Join us in the upliftment and freedom of the worldwide feather tribe with this beautiful unique hand carved wood feather necklace..... #TogetherWeFly! The flight feather is one of our original designs in the feather tribe, and a very popular one at that. It is modelled on the feather from the wing of the bird. The flight feather represents the ability for us all to spread our wings and fly. Promoting strength and confidence. This feather also comes in Small, Large and Mega. 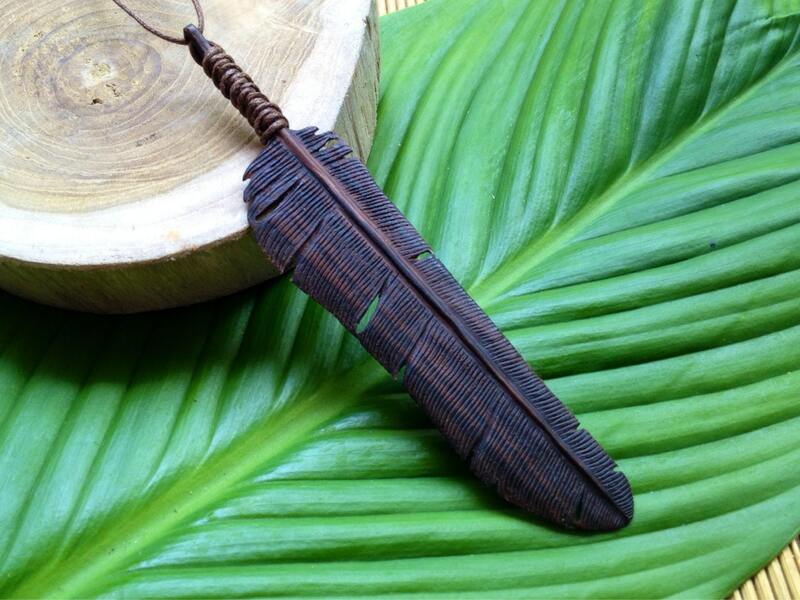 The feather is hand carved from a kind of wood called Sono (dark brown/black with reddish streaks). The pendant comes with 1mm premium waxed polyester cord in black. A heartfelt social enterprise business by which we share the joy of giving to a charitable cause through a percentage of the profits of our beautiful feathers, bird and wing inspired, carved, cast and hand crafted jewellery. We sponsor different campaigns all over the world so keep in touch with whats up through our social media channels. Beautiful creation of the symbolic use of Chakras & Kundalini with the wings of a angel. I absolutely love the size, details and everything about this piece!!!! The shipping to US was scheduled as stated with no additional charges or delays. The package was safely protected with no damage from the long travels and was wrapped for a nice gift. Would order from here again!!!! Thank you!! !